“We will not be silenced and brainwashed by your media,” read a message posted by a group of Lebanese hackers on government websites they brought down this week. We know little about the group, who now claim to have joined the global “Anonymous” movement, but what they wrote strikes a chord for many Lebanese who are dissatisfied with local journalism, particularly television news, which remains the most widely consumed medium. 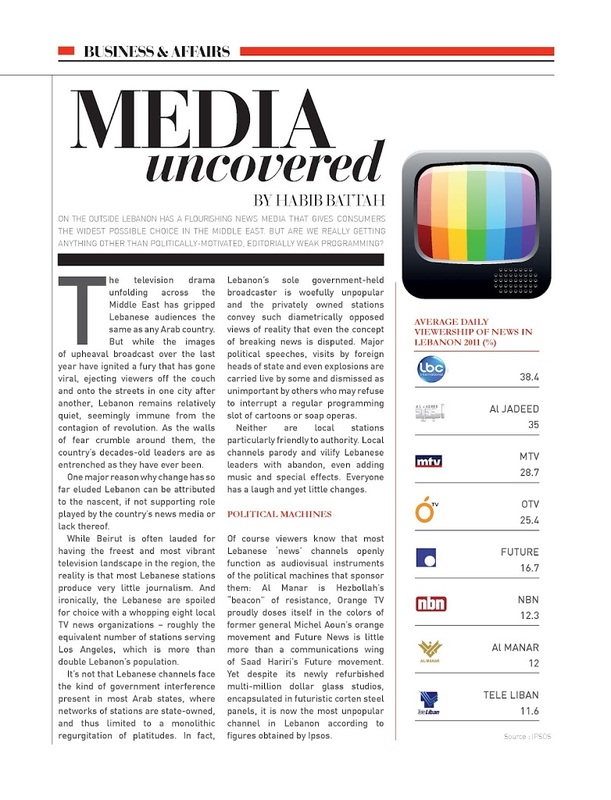 In my “Media Uncovered” column for last month’s issue of Bold Magazine (pictured above) I develop the critique of Lebanese TV news further, suggesting that even so-called independent local stations have served to sustain the current regime’s decades-old grip on power, which remains largely unchallenged. 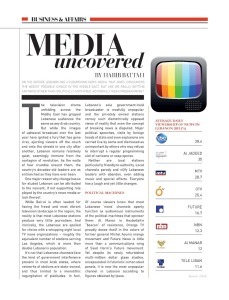 The television drama unfolding across the Middle East has gripped Lebanese audiences the same as any Arab country. But while the images of upheaval broadcast over the last year have ignited a fury that has gone viral, ejecting viewers off the couch and onto the streets in one city after another, Lebanon remains relatively quiet, seemingly immune from the contagion of revolution. As the walls of fear crumble around them, the country’s decades-old leaders are as entrenched as they have ever been. One major reason why change has so far eluded Lebanon can be attributed to the nascent, if not enabling role played by the country’s news media or lack thereof. While Beirut is often lauded for having the freest and most vibrant television landscape in the region, the reality is that most Lebanese stations produce very little journalism. And ironically, the Lebanese are spoiled for choice with a whopping eight local TV news organizations–roughly the equivalent number of stations serving Los Angeles, which is more than double Lebanon’s population. It’s not that Lebanese channels face the kind of government interference present in most Arab states, where networks of stations are state-owned, and thus limited to a monolithic regurgitation of platitudes. In fact, Lebanon’s sole government-held broadcaster is woefully unpopular and the privately-owned stations convey such diametrically opposed views of reality that even the concept of breaking news is disputed. Major political speeches, visits by foreign heads of state and even explosions are carried live by some and dismissed as unimportant by others who may refuse to interrupt a regular programming slot of cartoons or soap operas. Neither are local stations particularly friendly to authority. Local channels parody and vilify Lebanese leaders with abandon, even adding music and special effects. Everyone has a laugh and yet little changes. Of course viewers know that most Lebanese ‘news’ channels openly function as audiovisual instruments of the political machines that sponsor them: Al Manar is Hezbollah’s “beacon” of resistance, Orange TV proudly doses itself in the colors of former general Michel Aoun’s orange movement and Future News is little more than a communications wing of Saad Hariri’s Future movement. Yet despite its newly refurbished multi-million dollar glass studios, encapsulated in futuristic corten steel panels, it is now the most unpopular channel in Lebanon according to figures obtained by Ipsos. At a 10.9 percent average daily viewership, Future News trails closely behind state broadcaster Tele Liban at 11.6 percent and Al Manar at 12 percent. Perhaps encouragingly, Lebanon’s top three performers– LBC at 38.4 percent, Al Jadeed at 35 percent and MTV at 28.7 percent– do not claim to directly represent a political party or particular politician. But they’re not doing much better job at informing audiences. This is painfully apparent from the opening of each evening’s newscast when instead of immediately satisfying viewers’ thirst for information, these channels pause to cling to the shameful Lebanese broadcasting tradition of tainting the tone from the outset with an editorial. During a blisteringly long monologue of several minutes–an eternity in television time–we see no pictures, as the anchor laboriously mouths a metaphor heavy script that melds the most disparate of local and international headlines. Almost anything can be cobbled together, from a visit by the Turkish foreign minister to local opposition to a minimum wage hike, to form a disjointed narrative, as convoluted as it may be. Once the preaching subsides, what follows is a bulletin led more by press conferences than actual reporting, with correspondents hurriedly dispatched to the mansions of various feudal Lebanese leaders, rushing to capture their reaction to what someone else has done or said elsewhere in Lebanon or the world. The fountain of flattery continues as a great chunk of time is devoted to the essential stream of visitation segments, where various and sundry officials are seen endlessly smiling and shaking hands in ornate living rooms. Narrated by a monotone voice over, viewers are quickly told who is there, but almost never what they had to say, if anything of substance was said at all. Bizarrely, one of these pieces recently aired on Al Jadeed featured the news anchor himself in a visit to the army chief’s office. There was no explanation of course. At the end of all this, seldom does there remain enough time in the half-hour broadcast for a journalistic investigation into average citizens’ concerns such as the daily power outages Lebanon has seen for decades or their root cause: the corruption and cronyism routinely engaged in by officials and private corporations. When issues are covered, the tone is highly superficial, and frequently characterized by uncorroborated accusations that suit the channel owners’ interest in catering to one shifting ruling alliance or another. Incumbent high level officials or CEOs are almost never held accountable through tangible or documented research. a variety of viewpoints to avoid appearing partisan. But this only reinforces the system of disputing players, almost all of whom occupy a media spotlight they have held for decades. More often than not, that spotlight was once held by their father, cousin, uncle or grandfather. Lebanon’s so-called independent news channels appear to represent the country’s only forum for public accountability. Yet beyond parroting the shallow potshots launched by feuding parties and their sponsored stations, they remain too timid to dig deep into the fundamental issues that implicate the system of Lebanese authority and its squandering as a whole. By simply acting as an exchange for attackers, these stations drive supporters closer to their patrons, reinforcing the ruling structure rather than demystifying it. Can Nasrallah help RT's low ratings?